Toyota Motor Corp President Akio Toyoda attends a news conference in Tokyo February 17, 2010. Toyota Motor Corp. President Akio Toyoda said on Feb.17 he is unlikely to attend a U.S. congressional hearing later this month over the safety of Toyota products, and North America chief Yoshimi Inaba would attend in his place. "I have full confidence in the abilities of Mr. Inaba, and I believe he is the best person to testify," Toyoda told a news conference in Tokyo. Toyoda denied accusations that the company had tried to cover up the safety problems and promised to take measures to reinforce quality control. 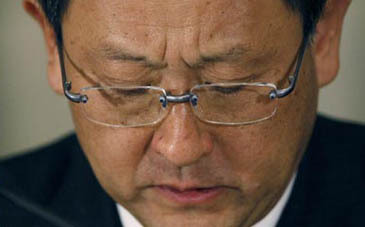 "We have never covered up or run away," Toyoda said. His comments came as the U.S. National Highway Traffic Safety Administration (NHTSA) said Tuesday it is using its statutory authority to obtain documents from Toyota to determine if the automaker' recalls have been made in a timely manner. The Toyota company said it has established a special quality control committee, headed by Toyoda, which will hold its first meeting on March 30. Issues studied by the committee will also be reviewed by external experts, it added. Toyoda also said that his company would develop a new braking system that would make the cars safer. The new system will cut the power to the engine if the accelerator and brakes are applied simultaneously. "The basic rule of Toyota is to only build as many cars as there is demand for, but we have broken our own rule," Toyoda said. He added that there would be a review of the structure of the company in order to ensure the safety of the cars in the future. Toyota announced last week it would recall 437,000 vehicles worldwide because of problems with brakes on its best-selling Prius and three other hybrid models, inflicting serious damage to the company's reputation.